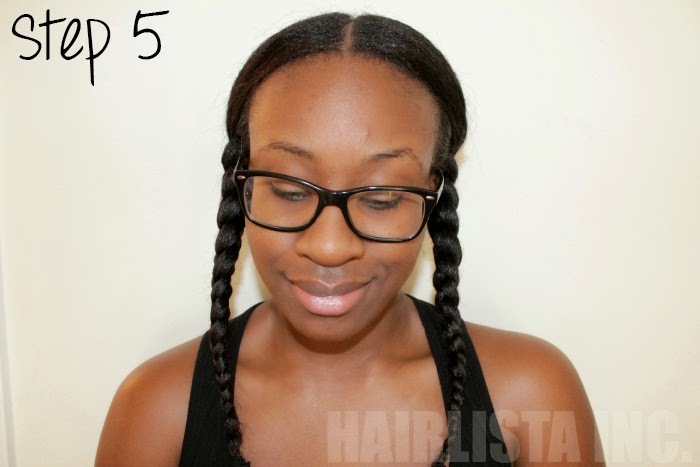 ESSENCE.COM Straight Talk: Are Your 2015 Hair Resolutions Realistic? As 2014 quickly comes to an end and we reflect on our hair progress throughout the year, it’s important to be realistic when setting new goals for 2015. Setting goals that are congruent with our lifestyle is a key factor for success. Here are a few things to keep in mind when you are creating your goals for 2015. If you want to grow your hair from shoulder length to mid-back length in 6 months, think twice. Remember, our hair does not grow very long overnight! We grow on average ½ an inch per month, which equates to 6 inches a year! Aim to go from shoulder length to armpit length in 6 months to 1 year. Chances are, you’ll reach your goal way before you anticipated! Writing down your hair goals and keeping track of your progress is an excellent way to stay on top of your hair ambitions. Journaling will help you to set your path and you can make adjustments when needed. Expect bumps along the way! You may not achieve your goal on the first try – that’s okay! It will not always be smooth sailing. Trial and error is part of the journey. Without the “hiccups” we experience, we wouldn’t truly understand our hair. Embrace the ups and downs, have patience and most importantly stay consistent! Be sure to check out the original article over at ESSENCE.com | Straight Talk: Are Your 2015 Hair Resolutions Realistic? Not detangling thoroughly before relaxer - nothing but knots & tangles...bad I know! Overall, I've been pretty consistent with my hair care regimen in 2014 and I have a good handle on what my hair likes vs. what it doesn't like. This year, I've found more staples and hair styles that I truly adore for any occasion! Yes, it's great to experiment; however, I try not to stray too far away from "the usual" to avoid any major setbacks. It's all about balance! 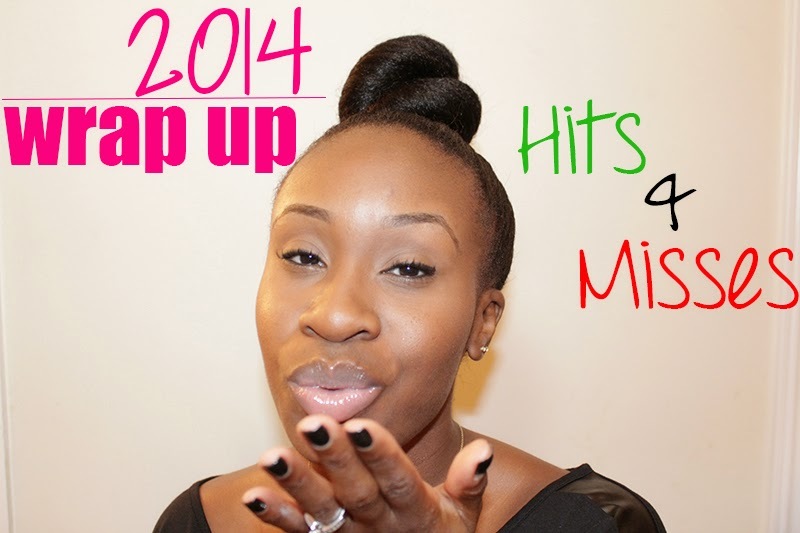 What were your Hits & Misses for 2014? What styles or techniques did your hair love or absolutely hate this year? Hurry and get 20% off all products when shopping online! Stock up for the upcoming Castor Oil Challenge starting January 2015! When I’m stretching my relaxer I like to do low manipulation styles to camouflage my new growth. Twist-outs are fun and playful. They give me just the right amount of volume and wave to spice up my hair. The best part is, they are super easy to do and great for any occasion! I like to moisturize and seal my hair first to lock in moisture. I then part my hair in 5 sections. I apply 1 pump of my favourite foam lotion to each section. Twist it up and clip. Take one section, split it in two (2). 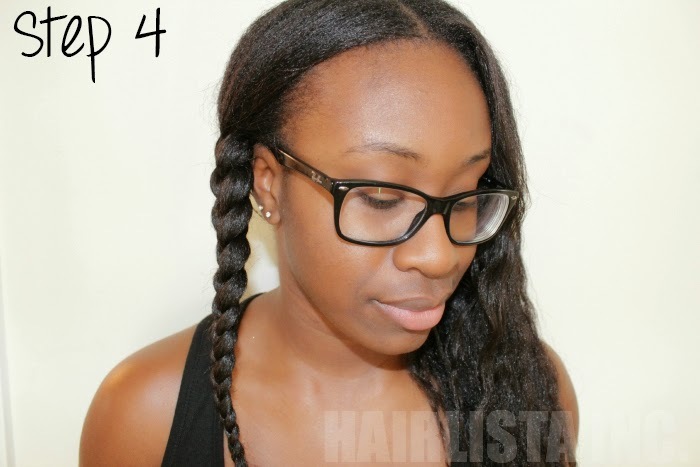 I grab one of those sections and begin to two-strand twist all the way down to my ends. I twist each section tightly for more curl definition. Starting from my ends, I roll the perm rod all the way up to my roots. I continue to twist my entire head until complete. Each section should have 2 two-strand twists with perm rods on the ends. I have a total of 10 sections. At this point, I go under the hooded dryer for 15-20mins to allow the foam lotion to set. I throw on my satin bonnet and go to bed. In the morning, I remove the perm rods carefully, trying not disturbing the curl. I unravel my twists, separate, fluff and go! Are you a twist-out fan? What method do you use? Bis-Aminopropyl Dimethicone is an amine-funcitonalized silicone. Some call it a "water-insoluble" silicone. Typically found in instant conditioners. It bonds to damaged areas of the cuticles adhering to the hair strands making the hair feel and look healthier. It creates a light film on the hair imparting shine, silkiness and body. It provides excellent wet and dry comb-ability. It does not create a build-up on the hair, like most silicones. It is not supposed to accumulate on top of itself after multiple applications - it's not attracted to itself. Removing this ingredient is tricky; therefore; using a sulfate shampoo is key! Which products contain this ingredient? Back in the day, I used to see Aussie 3 minute miracle at my local Walmart, now this product doesn't exist! I can't find it anywhere. 'Till this very day, I still hear positive reviews about this conditioner. Many ladies use it as a deep conditioner too. Without hesitation, I picked up a few conditioners to last me for a while. I can't wait to try them out during my next co-wash session. 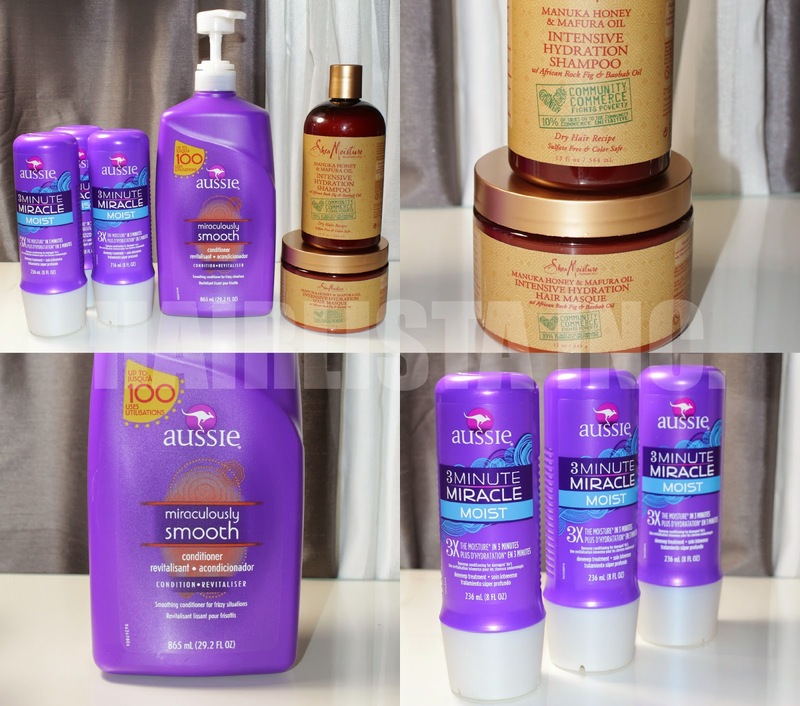 Aussie Moist has always been one of my "go-to" conditioners when co-washing. While strolling the isles of Target, I noticed a new conditioner called "Miraculously Smooth". Sounded tempting so I grabbed it! The ingredients are very similar to Aussie Moist, but this conditioner has Silk and Jasmine extract. 1. Manuka Honey - Anti-inflammatory properties soothe the scalp. Helps create a moisturizing barrier. 2. Mafura Oil - High levels of beneficial oleic acid help replenish oils stripped from hair. 3. African Rock Fig - Contains antioxidant Vitamin C, which helps keep hair looking vibrant. 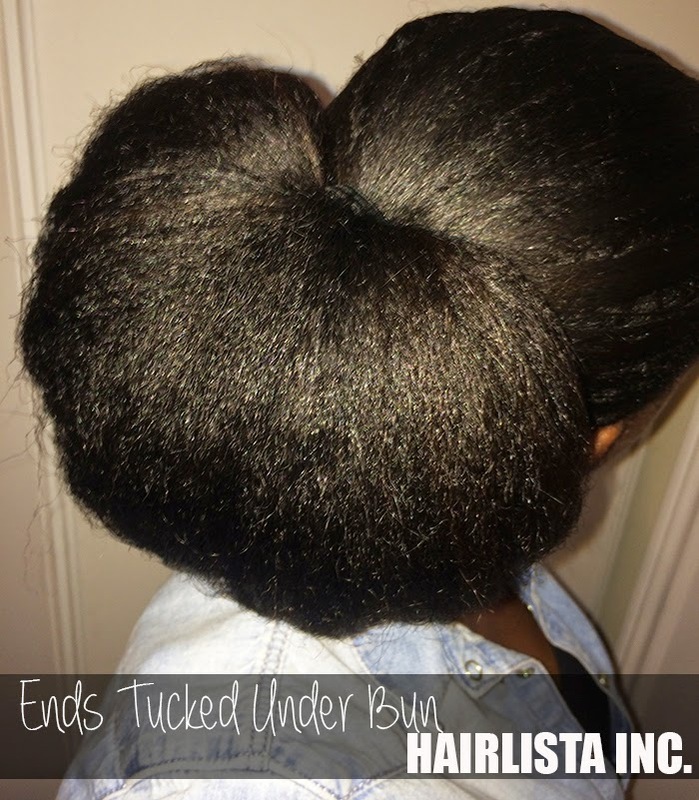 Bunning is one of my favourite quick and easy “go-to” styles. There are various buns that I’ll choose at any given time, but the bun-style that has grabbed my attention lately, is the Top knot bun! This style has been a hot trend lately. It’s sophisticated, chic and I love how quick and easy it is. You can dress it up for a night out or you can dress it down for a messy top knot look – it will still look fabulous! 2. 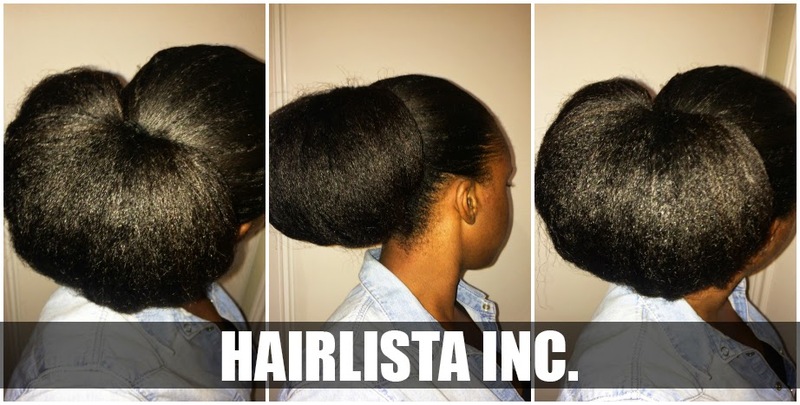 Gather all of your hair to the top of your head (where you want the bun to be placed i.e. crown region) and secure your hair with a ponytail holder. Make sure it’s not too tight. 3. Take your hair in the ponytail and split it in two. 4. 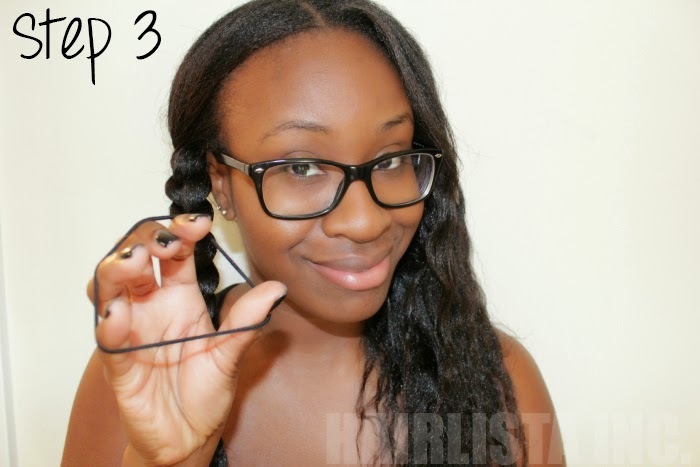 Begin to do a loose two-strand twist with your hair. 6. Go over your hair with a 100% Boar Bristle Brush so your hair and edges are smooth and in tack! I love rocking this style. It’s fun and the bun looks like a sophisticated intricate knot! Enjoy. Do you play in your new growth too? 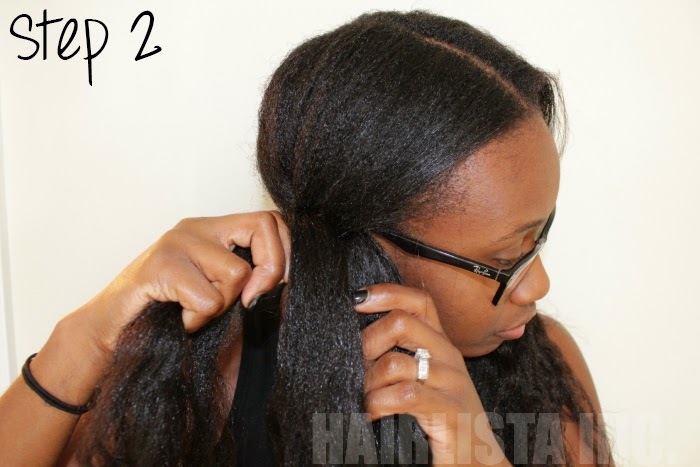 How long do you stretch your relaxers for? Almond and Shea Butter moisturizing shampoo gently cleanses the hair and scalp without stripping natural oils. Almond nourishes the hair to help it grow long and strong. Shea butter deeply moisturizes while repairing damage to the hair and scalp. Citrus contains vitamins that cleanse and increase scalp circulation. 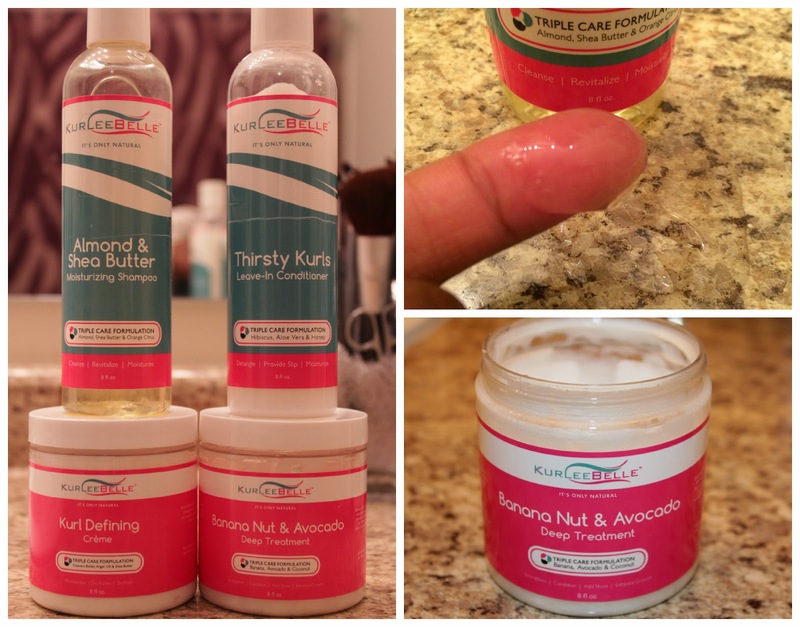 Banana Nut & Avocado Deep Treatment is just what the doctor ordered for dry, damaged hair. Bring those tresses back to life with our smooth concoction of Banana, Avocado, Honey and Coconut. Banana is rich in potassium and hailed for its moisturizing properties. Avocado contains fatty acids that nourish, smooth and soften hair. Honey provides shine while conditioning to make hair soft and supple. Coconut hydrates, conditions and softens. 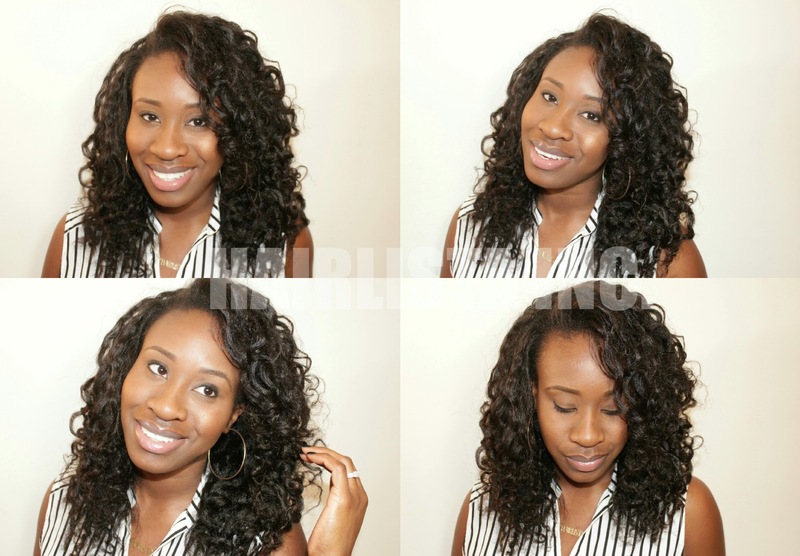 Thirsty Kurls Leave-In Conditioner provides "lots of slip" and moisture that detangles and softens curls. Hibiscus penetrates the cuticle to maintain acid balance. Aloe Vera soothes and moisturizes dry, damaged hair. Honey hydrates and helps the hair retain moisture. Kurl Defining Creme moisturizes, de-frizzes and defines curls. For soft, shiny, elongated curls, Cupuacu Butter promotes moisture and elasticity. Argan oil contains vitamins and fatty acids that strengthen and encourage growth. Shea Butter deeply moisturizes while repairing damage to the hair and scalp. 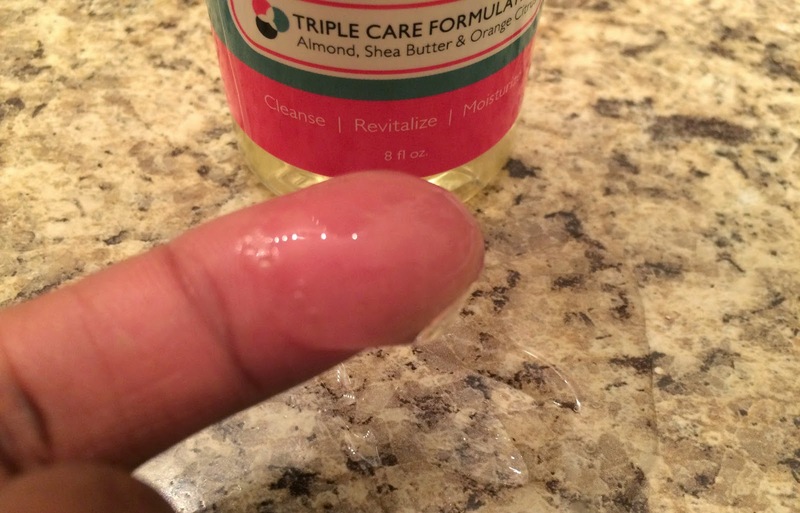 Apply Almond & Shea Butter Moisturizing Shampoo to wet hair. Gently massage into hair and scalp to create a rich lather. Rinse and repeat as necessary. Apply a generous amount to wet hair. Gently massage into scalp and comb through with fingers or wide tooth comb. Cover with a plastic cap. Sit under hooded dryer for 5-20 minutes. Rinse with cool water. After shampooing with Almond & Shea Butter Moisturizing Shampoo apply a generous amount of Thirsty Kurls Leave-In Conditioner. Apply a generous amount to wet or dry hair and style as usual. 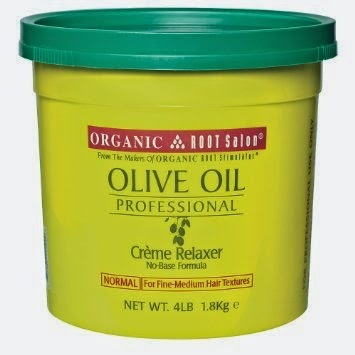 Great for twists, braids and as a daily moisturizer. Water (Aqua), Sodium C14-16 Olefin Sulfonate, Disodium Laureth Sulfosuccinate, Cocamide MEA, Cocamidopropyl Betaine, Sodium Lauryl Sulfoacetate, Prunus Amygdalus Dulcis (Sweet Almond) Oil, Butyrospermum Parkii (Shea) Butter, Apple Cider Vinegar, Polyquaternium- 10, Polyquaternium-7, PEG-12 Dimethicone, PEG-150 Distearate, Tetrasodium EDTA, DMDM Hydantoin, Citric Acid, Fragrance (Parfum). Water (Aqua), Cetearyl Alcohol, Cetyl Alcohol, Behentrimonium Methosulfate, Stearic Acid, Potassium Sorbate, Musa Sapientum (Banana) Fruit Basil Oil, Persea Gratissima (Avocado) Oil, Honey Extract, Cocos Nucifera (Coconut) Oil, Hydroxyethylcellulose, Tocopheryl Acetate, Disodium EDTA, Sodium Hydroxide, Fragrance (Parfum). Water (Aqua), Cetearyl Alcohol, Butyrospermum Parkii (Shea) Butter, Behentrimonium Methosulfate, Simmondsia Chinsensis (Jojoba) Seed Oil, Emulsifying Wax, Hibiscus Rosa-Senensis Extract, Aloe Barbadensis Leaf Juice, Honey Extract, Tocopheryl Acetate, BHT, Phenoxyethanol, Ethylhexylglycerin, Fragrance (Parfum). Water (Aqua), Ethylhexyl Palmitate, Stearic Acid, Cocos Nucifera (Coconut) Oil, Butyrospermum Parkii (Shea) Butter, Glycerin, Montmorillonite, Simmondsia Chinensis (Jojoba) Seed Oil, Cetyl Alcohol, Theobroma Grandiflorum (Cupuacu) Butter, Argania Spinosa (Argan) Oil, Emulsifying Wax, Acrylates/C10-30 Alkyl Acrylates Crosspolymer, Tocopheryl Acetate, BHT, Disodium EDTA, DMDM Hydantoin, Sodium Hydroxide, Fragrance (Parfum). Typically, transparency in shampoo's indicate that it contains sulfates and/or detergents. This shampoo is just the opposite. Though, it's clear in colour, it has a thick consistency. I like how it contains Apple Cider Vinegar to lower the pH balance of the hair and remove buildup. It lathers quite well. More importantly, it's very moisturizing. My hair felt noticeably soft while rinsing out the shampoo. Unfortunately, there wasn't much slip to remove the few tangles I had. This is by far my favourite product from the entire line. It actually makes me mad that this deep conditioner comes in such a small bottle. Like why?! Interestingly enough, I was able to get about 3-4 uses out of it. My hair literally soaks up this creamy goodness. The slip is on point due to the Behentrimonium Methosulfate in the top ingredients. My hair feels hydrated and soft after each use. Love it! I didn't have much luck with this leave-in conditioner. I tried it on damp hair after I deep conditioned and even as a moisturizer, regardless my hair always felt stiff and dry :( I must say that the texture is very smooth and light. It spreads well over my hair. I love how slippy it is. It does a great job in removing my tangles, but once my hair is fully air dried, it feels dry! I really wanted to like the KB leave-in but my hair says otherwise. I do love the scent, it reminds me of baby powder. If you are sensitive to certain scents, this may be a little overwhelming for you. My hair gets very finicky when it comes to moisturizing cremes. It either sits on top of my hair making it feel greasy or it makes my hair crispy. My hair typically responds well to cremes with Glycerin in them and this one just happens to be one of them! The KB Kurl Defining Creme works so well on my relaxed strands. I was shocked. I typically use it on my braid-outs or twist-outs to lock in moisture. It also works great when I do the LCO Method. A little goes a long way! Works well for relaxed hair! Price: $14.00 - $18.00 USD/8 fl. oz. Karif Beauty is hosting a Relaxed Hair Chat on KARIFTV via YouTube December 14th, 2014 @ 3pm. Hair bloggers such as Relaxed Thairapy, GrowItGirl, including myself will be live sharing exclusive relaxed hair tips! You don't want to miss this. Cetrimonium Chloride is a positively charged surfactant which can also be used as a conditioning agent. It's typically found in conditioners and/or leave-in conditioners. It gently cleanses the hair while providing conditioning/detangling abilities, softness and making the hair smoother. Though it can cleanse the hair, it does not remove product build up. It also stops the build up of static electricity in hair, which in turn makes the hair smoother and easy to manage. Scurl No Drip has been my staple moisturizer for years. In 2013, Luster's changed the original Scurl No Drip ingredients and my hair disliked it - unfortunately!! Now, finding the Original formula is like finding a needle in a hay stack since it's discontinued! 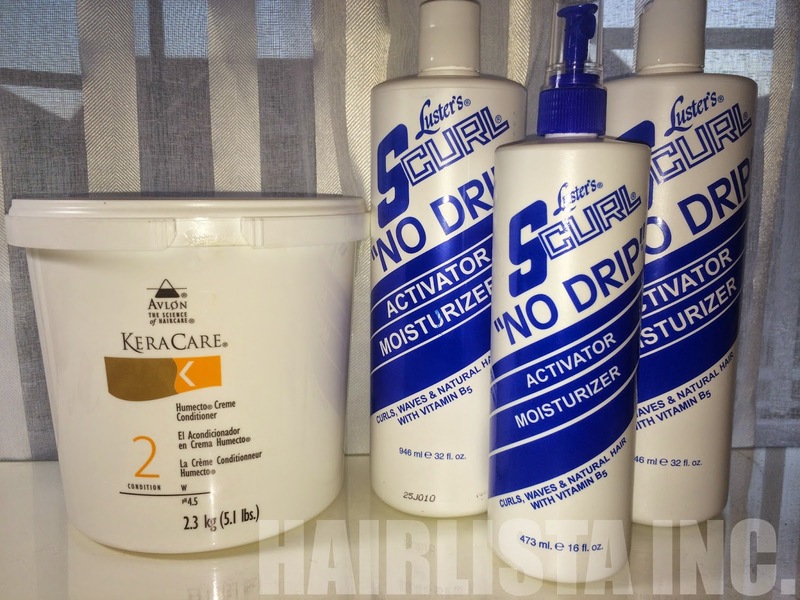 Luckily for me, I was able to find the Original Scurl No Drip Activator at a Beauty Supply Store a few towns away from where I live. Yes - I will travel for my products..LOL. You have no IDEA how ECSTATIC I was to have found the original formula. Without hesitation, of course, I grabbed all the Scurl they had left. Sorry... not so sorry! I had to stock up because who knows when I'll find the original moisturizer again. I'm always on the hunt...ugh!! I like to space out my relaxers as far as possible. My hair thrives when I relax every 10-12 weeks. By stretching out my relaxers I'm giving my hair a break and allowing my new growth to grow in fully before putting the relaxer on it. When your new growth is not visible, it's much easier to overlap the relaxer on the previously relaxed hair. This can cause thinness, breakage and overall damage. 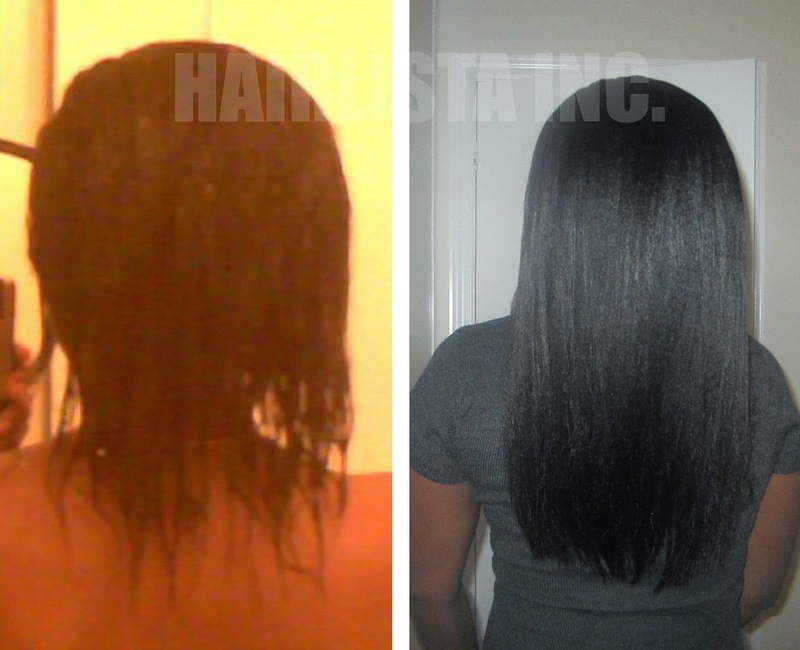 Stretching your relaxers makes your hair stronger and thicker over time. Normal strength relaxers tend to process the hair at a much slower rate than extra strength relaxers. The slower process along with my quick relaxer speed results in my hair not relaxed completely bone straight. There is still some texture left over in my strands. More texture means thicker dense strands. I like to pre-poo my hair with a mixture of conditioner and coconut oil before I shampoo. Coconut oil is known to protect the hair from protein loss when used as a pre-shampoo treatment. In other words, it helps prevent damage to the cuticle. Less damage means stronger fuller cuticle, which gives you thicker hair. I never relax my hair without my ends being protected from the relaxer. 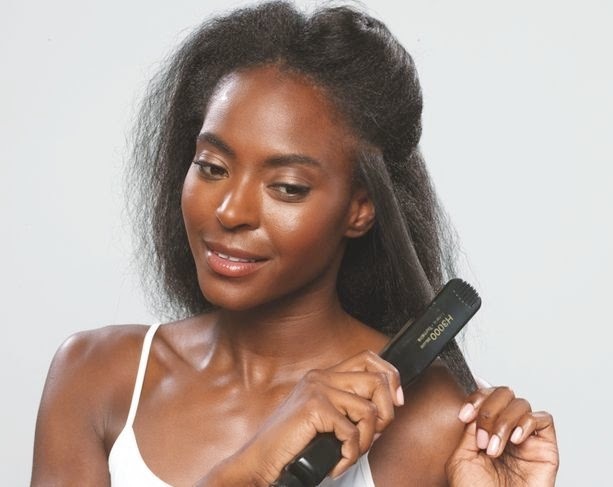 Relaxing previously relaxed hair can cause the hair to be over-processed eventually leading to thinness and breakage. 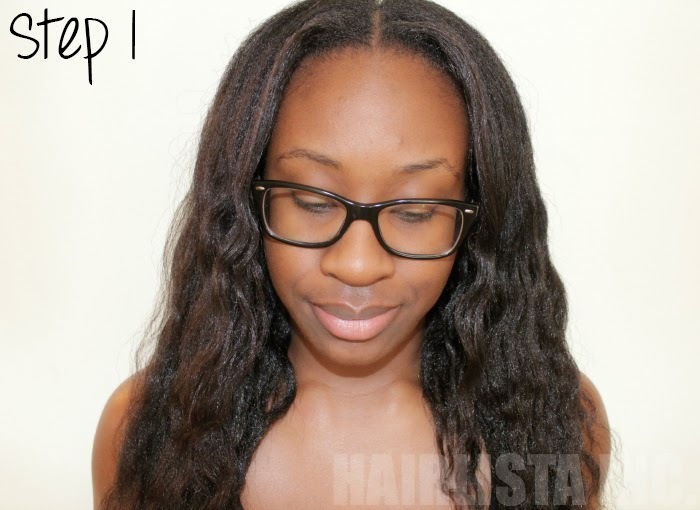 Protecting the length of the hair to the ends creates a barrier between your hair and the run-off of the relaxer. I like to use a thick Oil or Grease to protect my hair. I changed my regimen around in order to incorporate weekly protein treatments. Using reconstructors under a hooded dryer for 15-20 minutes is the best thing for my strands. Protein causes the hair to swell in diameter, therefore increasing the thickness. Protein treatments strengthen and fortify the hair preventing breakage. My deep conditioning technique has changed over the years. Sectioning off my hair in 5 sections is much more effective for me. I've been deep conditioning my hair like this for the past 2-3 years. It's effective, easy and I'm able to saturate all of my strands with just the right amount of conditioner. 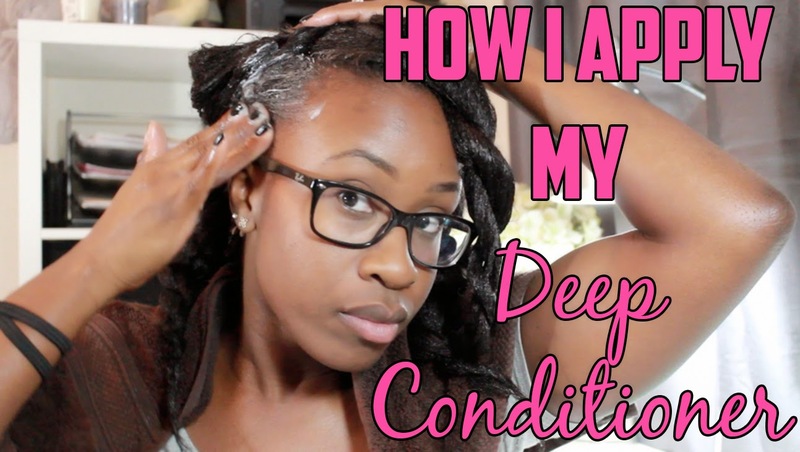 In this video I'm applying the conditioner to dry hair to maximize absorption. I still apply my deep conditioners to damp hair after I shampoo. I'm using Keracare Humecto Creme Conditioner mixed with the 3PO - Avocado Oil, Coconut Oil and Olive Oil. I then go under my steamer for 30 mins, rinse, co-wash, apply my leave-ins and air dry. Promises: The Protective Mist Bodifier is a daily leave-in conditioner. Can also be used for comb-outs and detangling curly hair. Use on wet or dry hair. 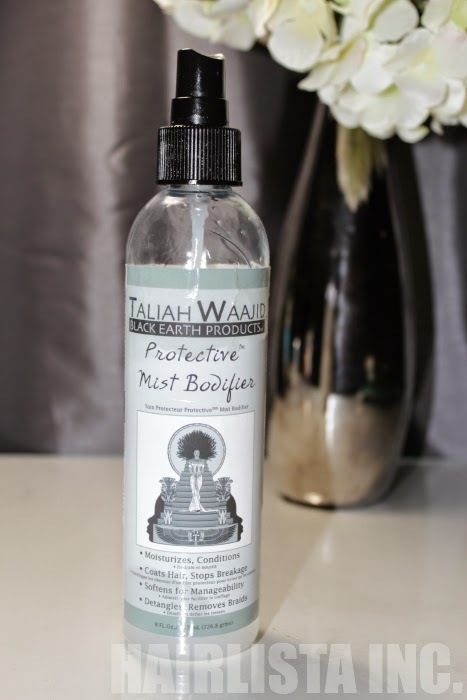 The Protective Mist Bodifier coats, protects and softens the curl patter. This results in easier to comb hair as well longer lasting styles. Directions for Daily Conditioning: Spray on scalp and hair from the root to the ends. Use at least three times a week for best results. Directions for Comb Out/ Detangling: After completing steps 1-3 of the Black Earth System, towel dry hair and separate into large plaited sections, start at the nape area and un-plait one section at a time. Apply Protective Mist Bodifier to the hair in the un-plaited section. Comb through using a large toothcomb. Comb out from the ends and work up to the roots. Ingredients: Water, Propylene Glycol, Glycerine 99.7%, Cetearyl Alcohol and Ceterium Bromide, Cetyl Alcohol, Olive Oil (Olea Europaea), Wheat Germ Extract (Triticum Vulgare), Caprylyl Glycol Phenoxyethanol, and Fragrance (Parfum). Truth: I tend to share products with my sister as we are both on a hair journey. She tried this product and it was just "okay" for her. She told me to try it out to see if it was something I may like. Needless to say, I was a bit skeptical due to the Olive oil already in the ingredients. This reminded me of the New Scurl No Drip Ingredients - which did not work well with me. Fortunately, this product was the opposite of what I had imagined! For the past couple months, I've been spraying it in my roots and my ends (as a moisturizer) - my hair feels soft and retains moisture easily. It reminds me of Scurl No Drip Activator due to the Glycerin, Propylene Glycol, and Cetearyl Alcohol. It's a great alternative. I love the fragrance! It's not overbearing at all. It smells like a mixture of coconuts and fruit. It's a nice subtle scent that lingers in your hair. 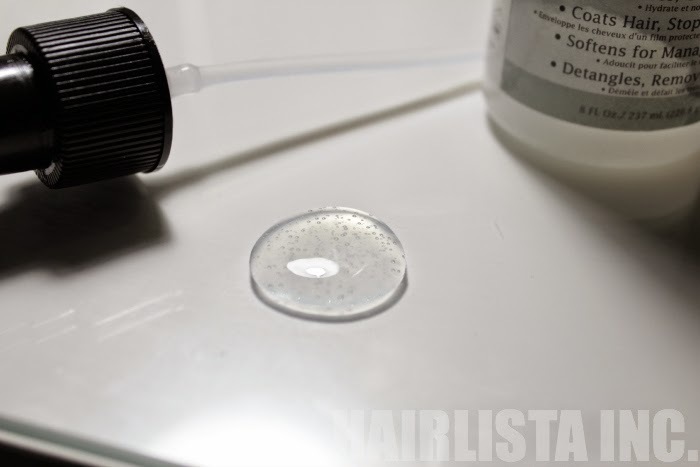 The consistency is similar to Scurl No Drip Activator, however, it's a little thinner and transparent. I find the detangling properties in this product slightly weak. I would not use this product for detangling purposes. Bonus, it's silicone free too! I would definitely re-purchase. Cocamidopropyl Betaine is a surfactant cleansing agent and foam booster. It's a gentle detergent partly derived from Coconut oil. It gently removes oils and build up from the hair. Very mild in comparison to SLS (Sodium Lauryl or Laureth Sulfate). Commonly found in shampoo's. 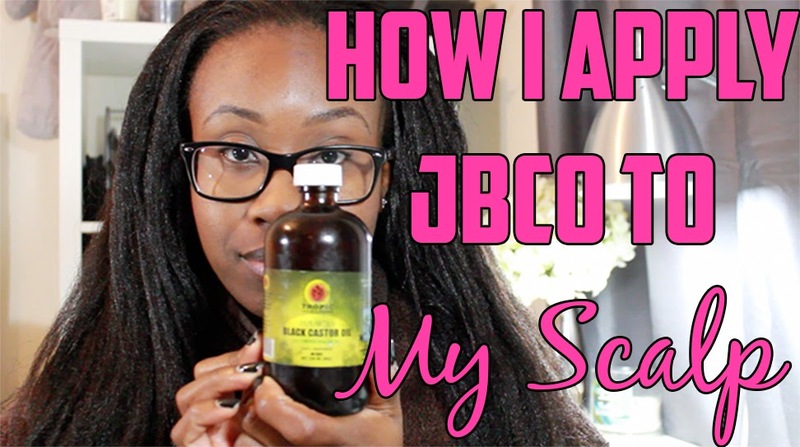 In this video I demonstrate how I apply JBCO to my scalp and how I use it in my regimen. 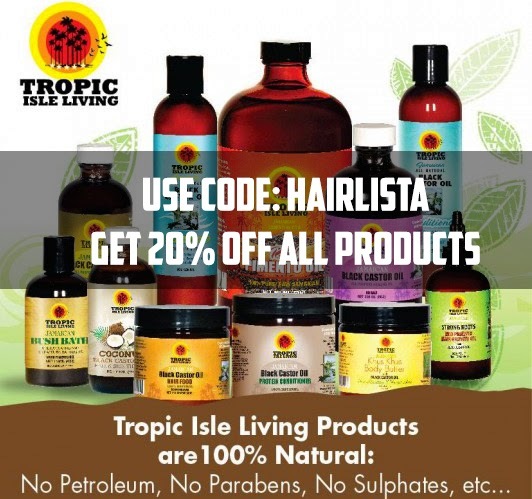 Are you a fan of Jamaican Black Castor Oil? How do you use it? I protect my ends (especially during the winter months) in buns approximately 95% of the time. Keeping my ends away from the elements i.e. extreme weather, has allowed me to retain moisture and length. For me, the less exposure and manipulation, the better. There are a variety of buns that I love doing i.e. slinky high bun, twisted low bun, top-knot bun, donut high/low bun etc. There's just so many. 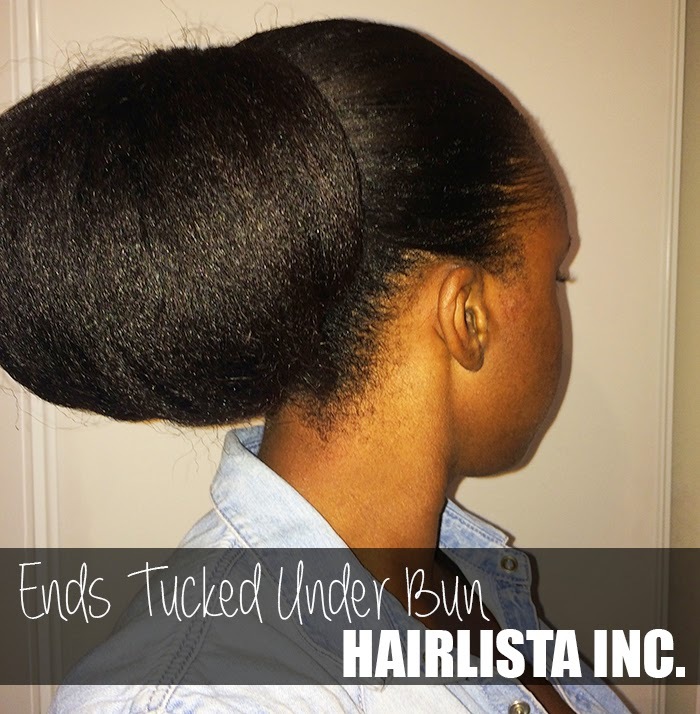 Lately, I've been wearing my ends tucked under, as seen in the pics above and below. I also like to style my hair like this while I'm air drying (approx. 70-80% dry, technically it's still damp). Sometimes I'll use bobby pins to pin it under, other times I'll just secure my ends with my ponytail holder (by not removing my hair out of the ponytail holder completely). I love how quick and easy this style is!! What are your favourite "go-to" bun hairstyles? 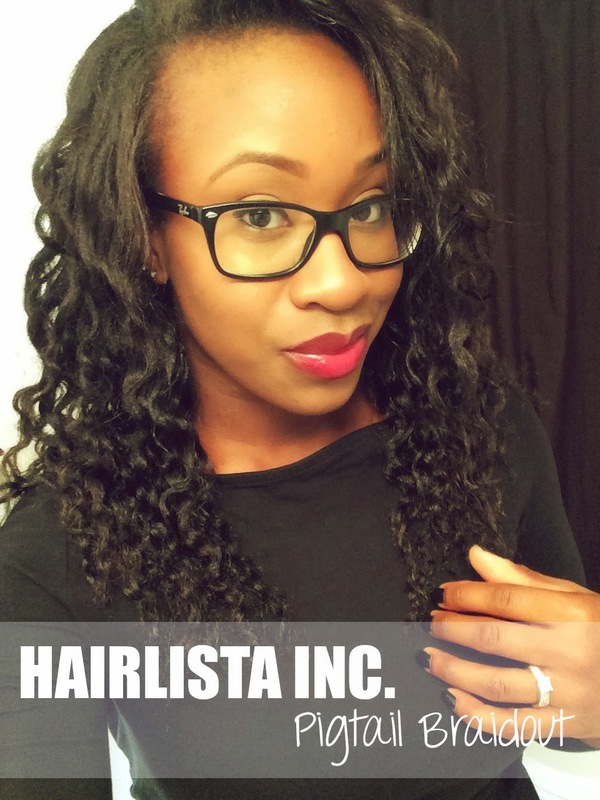 If you're a fan of braid-outs, like I am, then this style is for you! I've been doing "pigtail braid-outs" (yes, that's what I call it... LOL) on my hair for years now. It's an easy "go-to" hair style that can be achieved overnight with great definition for any occasion. Usually braid-outs are done on wet/damp hair; however, this style can be achieved on dry unwashed hair - so convenient! I love how defined my waves are and this style lasts all day long! Below you'll see my steps to achieving this look. I start off with thoroughly combed moisturized hair. Hydrating my hair first, will ensure that it remains moist during the style. I part my hair down the middle, with my fingers or my comb. I begin to braid one section at a time. I braid each section hair firmly to increase wave definition. I secure the end of my braid with a ponytail holder. This will prevent the braid from unravelling. Braid #1 complete. I continue the same steps on the opposite side and secure the braid with a ponytail holder. At this point I'll put on my satin bonnet and head to bed. I typically pin up my ends with 2 bobby pins so that they are not hanging down in my bonnet, just a personal preference. That's it! In the morning I unravel each braid with a little bit of oil on my finger tips (you can use serum as well) to prevent frizz. I carefully separate each braid, fluff it out and go! 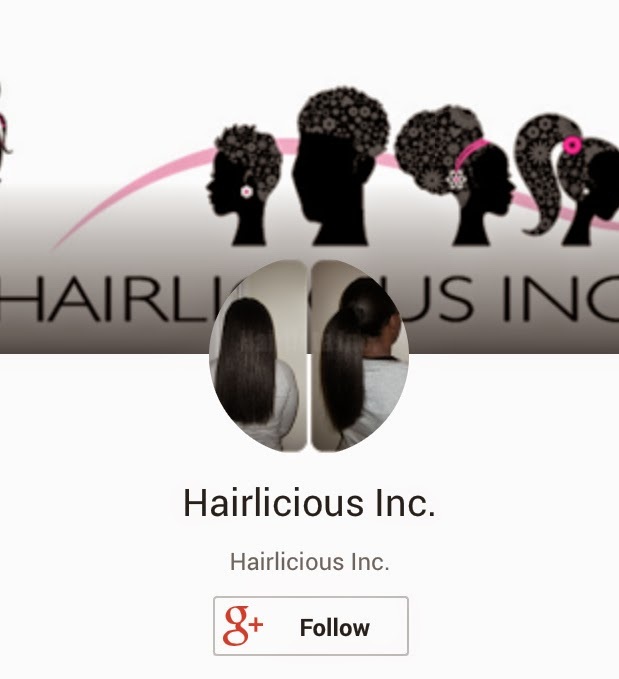 Hairlicious Inc. is now on Google+. Antistatic, cleansing and conditioning agent. Behentrimonium Chloride is an excellent detangler typically found in conditioners, deep conditioners and leave-ins. It's build-up free, softens the hair and conditions each strand. It provides potent conditioning effects to smooth the cuticle. 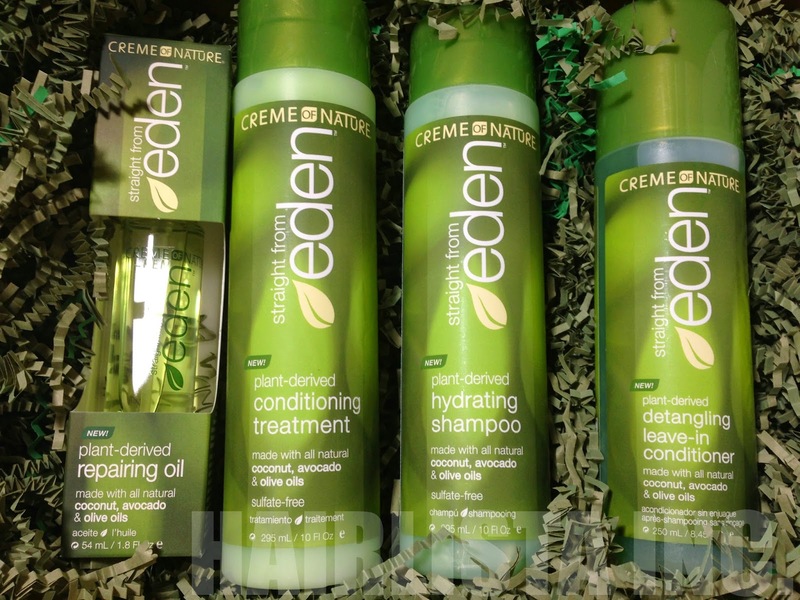 Created from the goodness of nature's garden, Straight from Eden system is infused with plant extracts derived from all natural Coconut, Avocado & Olive oils giving you seductively beautiful, irresistibly healthy hair. Instantly detangles, revitalizes & hydrates…naturally! Nourish your hair using the goodness of nature's garden with straight from eden plant-derived hydrating shampoo, a luxurious creamy & hydrating formula created to replenish moisture, while gently cleansing all hair types. This sulfate-free formula is made with conditioning plant extracts derived from coconut, avocado and olive oils. Strengthens, deeply fortifies & repairs…naturally! A rejuvenating & fortifying formula created for all hair types to strengthen hair and protect against damage and dehydration. Improve the manageability of your hair using the goodness of nature's garden with straight from eden plant-derived detangling leave-in conditioner, a nourishing and protective formula created for all hair types to condition, nourish and shield hair from damage. This naturally invigorating two-phase formula is made with conditioning plant extracts derived from coconut, avocado and olive oils. 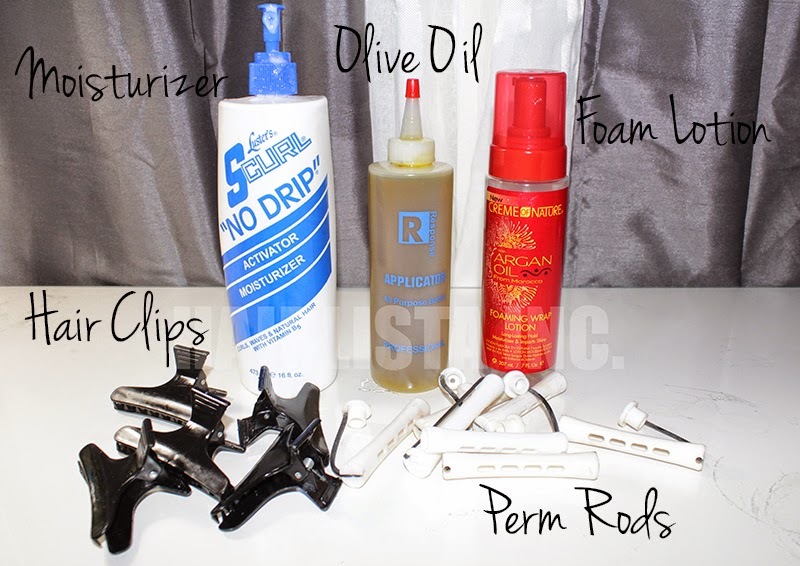 Repairs, controls frizz & adds shine…naturally! Restore the health of your hair using the goodness of nature's garden with straight from eden plant-derived repairing oil, a powerful restorative formula in natural hair created to reclaim strength and give brilliant natural shine to all hair types. This weightless nourishing natural fusion of oils uses coconut oil to add hydration and incredible softness, olive oil to help heal and strengthen, and avocado oil to restore shine and softness while strengthening for beautifully healthy hair. Apply to wet hair. Massage into a rich lather. Rinse thoroughly. Apply evenly from roots to ends. Gently comb through for even distribution. Leave on for 5-7 minutes. Rinse thoroughly. 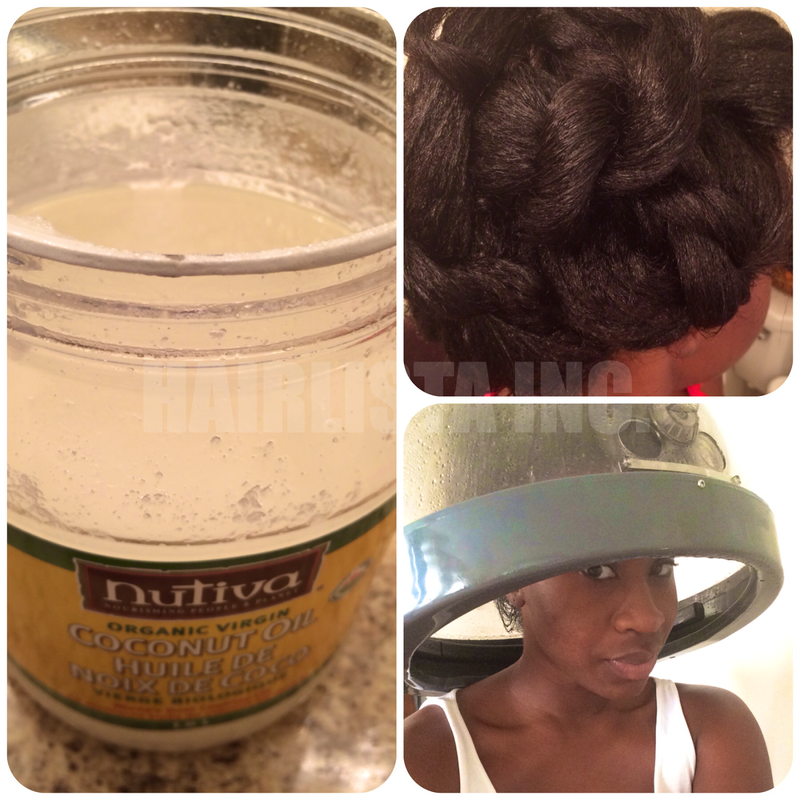 For deep conditioning, place a plastic cap over the hair and sit under a warm hooded dryer for 10-15 minutes. Rinse thoroughly. Style as desired. Shake well to blend and activate two-phase formula. Spray a generous amount throughout hair from root to ends. Spray evenly onto damp hair and comb through. Do not rinse. 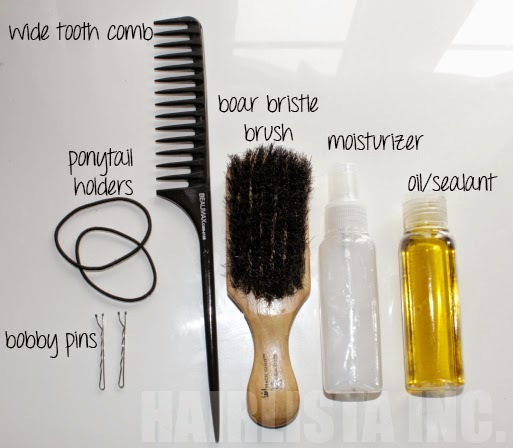 Beginning at bottom of hair, use wide tooth comb or paddle brush to gently remove tangles. Dispense a small amount of oil and rub into palm for even distribution. Apply to damp hair to help repair, control frizz and protect against heat damage. For best results, use weekly on wet hair after shampooing and conditioning. Apply to dry hair to restore health and enhance high gloss shine. Apply from scalp to ends, focusing on brittle areas. Very opaque in colour yet rich in texture. I love the fact that Creme of Nature made another moisturizing conditioner with great detangling properties and nourishing oils. If you don't know by now, I ALWAYS add Olive Oil, Coconut Oil and Avocado Oil to my conditioners for added benefits. These oils are known to penetrate the hair shaft improving your hairs health. The fact that Creme of Nature added them into each and every product providing benefits during each phase, is great! I've used this conditioner on dry and damp hair. I prefer it on wet/damp hair. I find that it soaks into my hair better. My hair comes out soft and fluffy with each use. The fresh citrus scent lingers in your hair after too :) Although it contains several oils, along with Shea Butter, this conditioner does not weigh your hair down. It has the exact same packaging as the shampoo; but I think the conditioner should be in a slightly bigger bottle. This is more like a serum than an oil. The first few ingredients are silicones which help protect the hair against frizz and heat. I haven't used it as a heat protectant, but I have used it to plait and unravel my braids for my braid-outs. It does a fantastic job at providing shine, smoothness and preventing frizz all day. Its silky smooth texture is light-weight on the hair, so I suppose it would be ideal before flat ironing.